We've been away on a family trip to southern Illinois last couple of days. As we were flying toward Tucson yesterday night about 9:30 pm MST, I could see very impressive lighting flashes in the tops of Cbs far to the east. When I checked radar once we got home, I found that the storms were near Albuquerque and Las Cruces, New Mexico. No rain here while we were away. 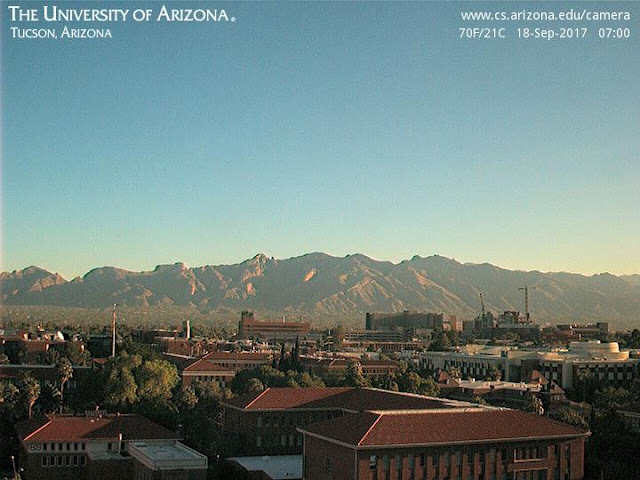 Today low-level moisture has pushed westward far enough for thunderstorms to develop over the Rincons - these are fairly impressive visually, but the air quality webcam that should be showing view east toward Rincons is apparently not functioning and two repetitive views of Catalinas are on that site. Radar above is also impressive and from 2:18 pm. Visible satellite image below is from 2:00 pm. It's possible that these storms could push an outflow into Tucson metro area, although latest MesoWest surface plot seems to indicate most outflow is into the San Pedro valley, east of mountains. Forecast models this morning have shifted the forecast closed low at 500 mb northward over southern Utah, and then move it slowly northward. This leaves most of Arizona in dry southwesterly flow. This morning's 12 UTC forecasts of total precipitation through midnight on October 1st are shown here. Above is on the 1.8 km grid and below is on the 5.4 km grid - Arizona is left high and dry, except along the New Mexico and Utah borders - not a promising forecast for remainder of month. It was the coolest morning so far here of meteorological Fall. Temperature here at house was 50 F at 7:00 am MST, and I had to wear light windbreaker on my morning walk. Temperature at TUS was 57 F and at DM AFB it was 55 F. Coolest temperature I found on Mesowest for this time was 35 F at a site east of Tombstone. 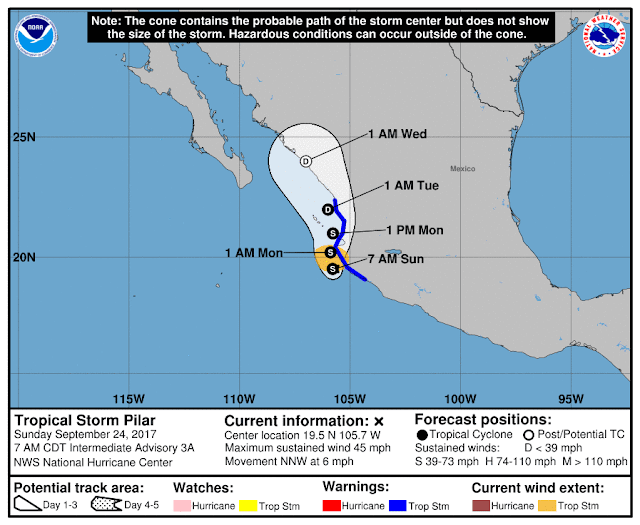 A new tropical storm - Pilar - has developed near Cabo Corrientes, Mexico. The NHC forecasts this morning (above) move the storm slowly northward and weaken it along the coast, before it gets into the GoC. Ernest Hemingway lived in Cuba off and on during his life and his 36-foot fishing boat was named "Pilar." After the intense hurricane of Labor Day 1935 struck the Keys, Hemingway took to the waters around the Keys on Pilar, and was involved in rescuing survivors and recovering bodies of the more than 600 people who perished. The story of the hurricane and Hemingway's involvements afterward are detailed in the book shown below. 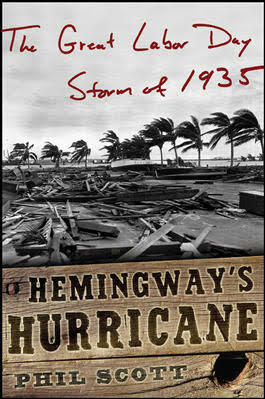 It is an interesting read and provides historical information about the hurricane, Hemingway's efforts and reactions, and the tragedy that befell mostly World War 1 veterans who were employed constructing the Florida Keys Highway. As for our weather - the large trough over the West pulls away to the northeast by mid-week, but a trailing short wave closes off over Arizona - above is the 00 UTC GFS operational forecast valid at 5:00 pm MST on Wednesday the 27th. In sync with this, easterly winds intrude from New Mexico, bringing higher PW into the state. The long term 00 UTC run of the WRF-GFS (on 1.8 km grid) teases our area as per chances of rainfall before month ends. Below is that model's forecast of precipitation through midnight on October 1st. Any Rain before September Ends? Cloud band this morning led to a beautiful sunrise - above looking east from Tucson Blvd., and bottom Finger Rock highlighted by some color. It was an interesting astronomical summer - the monsoon rains essentially fell from July 10th through August 13th, with hardly enough here the rest of summer to dampen the soil. Very dry conditions here with non-desert plants requiring attention nearly every day. Large trough continues to deepen over the West - 250 mb analysis above from SPC - with a strong jetstream of more than 100 kts crossing Arizona. But, this large system doesn't bring much moisture with it this far south, and subtropical moisture is shunted northeastward. Forecast below is from 00 UTC WRF-GFS last evening and is for total precipitation (on the 5.4 km grid) through 00 UTC on September 30th. 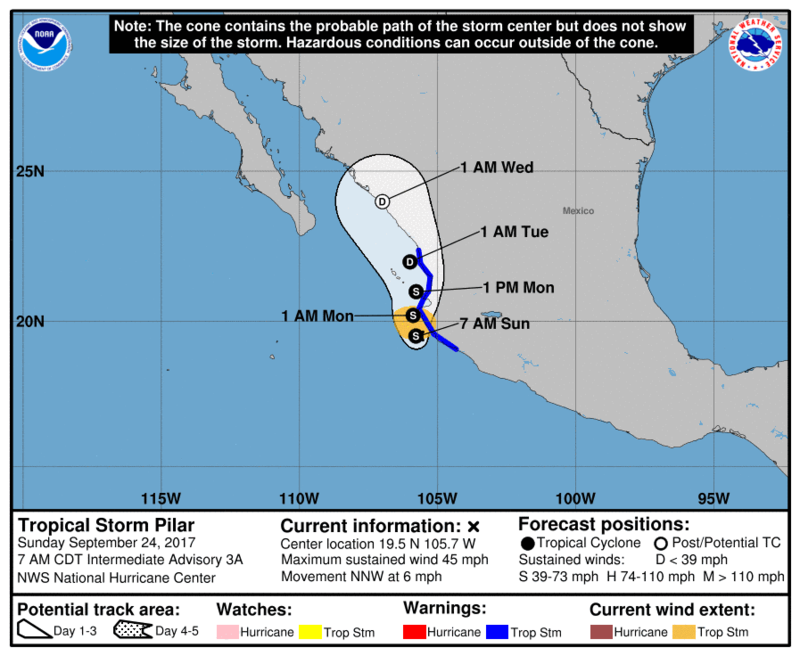 Heaviest rains forecast for northeastern Mexico and southwestern Texas, but also wet for High Plains and Southern Plains. At 500 mb a large, cold trough (below) is digging into the West - as has been well-advertised by the models for a week or more. 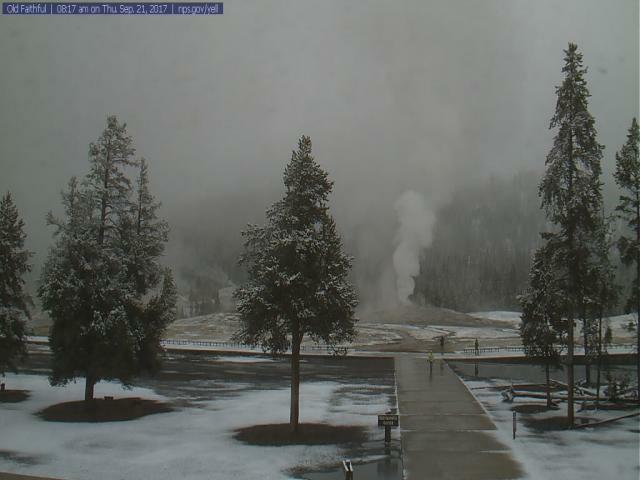 The system is bringing snow to the High Country - as per Old Faithful above, as well as strong winds to much of the West. By a week from now - GFS forecast below - the trough is still lingering, with a closed low over Arizona and New Mexico. Question is whether or not this system will tap-into any moisture to bring precipitation to Arizona. The tropical system's moisture down to the south will be shunted off toward Texas. Best chance will be wrap-around moisture coming westward from east of the Continental Divide. In the mean time we can expect dry, gusty winds, and a turn toward cooler temperatures for the weekend. Edited to add: Visible image of Maria at 2045 UTC this afternoon as she heads toward Virgin Islands and Puerto Rico at Cat. 5 intensity. Although low-level moisture has inched upward here in southeastern Arizona, considerably more is needed to develop CAPE at low elevations. September has produced only 0.12" rainfall so far, and looks like this month may be turn out to be driest ever since my records started in 1999. Visible satellite images from 1315 UTC this morning of Cat. 5 hurricane Maria above and Cat. 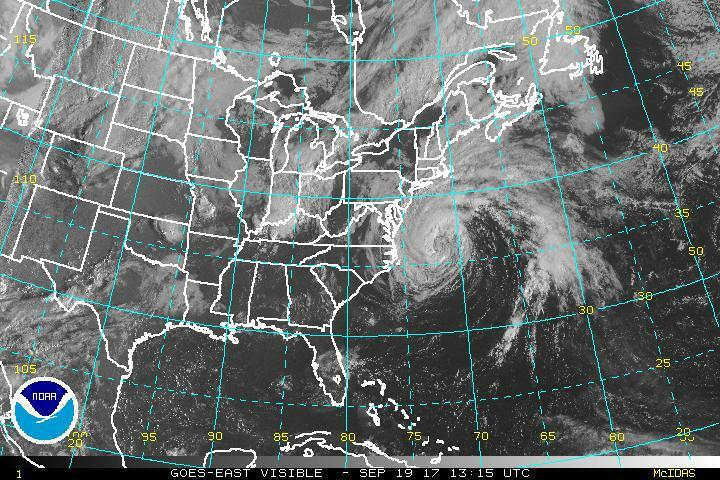 1 hurricane Jose below. 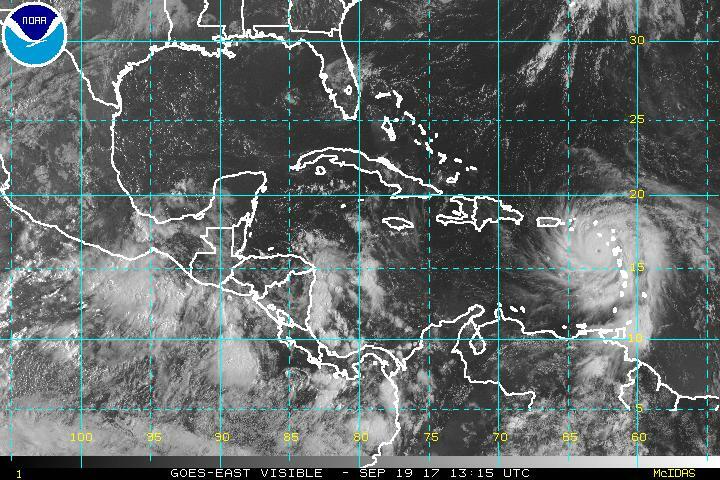 Puerto Rico may be more seriously impacted by Maria than it was by Irma. Below is from 00 UTC run of the WRF-GFS at Atmo and shows model forecasted precipitation, on 5.4 km grid, out through 5:00 pm MST on September 26th. Pretty grim for Arizona, while New Mexico has very wet conditions east of the Continental Divide. From the MAP List - the 12 UTC ECMWF operational forecast of 1000-500 mb thickness, valid at 180-hours. Storm to northwest is Jose, with Maria to his southeast. Same forecast from GFS (both are from operational versions of the models) below is very different. Very pleasant this morning for walking, with clear, cool, and dry conditions. At 7:00 am MST it was 70 F on campus, 69 F at airport, and 58 F here along the Rillito. Most weather attention during the coming week will be on the five named tropical storms - especially Jose and Maria. The current NHC status maps for this morning are shown here for both Basins - along with MIMIC TPW at 13 UTC. Here in the Southwest, as Norma pulls slowly away from the GoC, it appears that some low-level moisture will intrude into southern Arizona - so that will be something to watch locally. In the Atlantic the long-term future of hurricanes Jose and Maria becomes very complex in model forecasts, with the storms interacting with each other near the East Coast. There may be a Fujiwhara effect, as the storms could circulate around each other, since Jose is forecast to stall and loop to the south - the second time in the long-lived storm's history. Several thunderstorms yesterday afternoon around the flanks of the Catalinas - stubby little Cb above was around 4:00 pm MST. The thunderstorms produced some showers and the heaviest of these stayed just north of the ALERT network stations - three sites on north end of network had very slight amounts of rainfall. Storms produced some CG flashes also - as per 24-hour flash density ending at 7:00 am this morning (below, from weather.graphics and Vaisala). 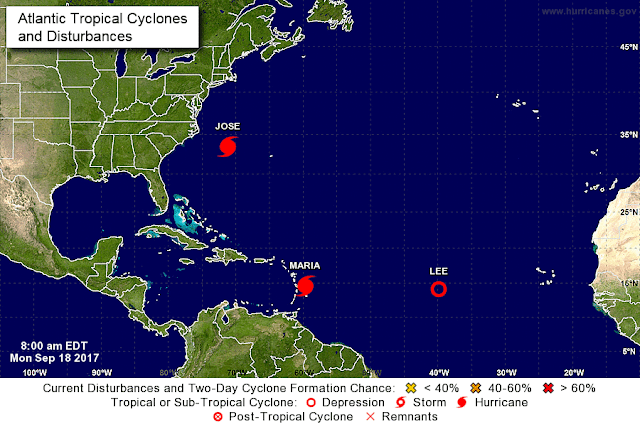 Edited to add: Turns out NHC named the easternmost system TS Lee and then the "X" system TS Maria. 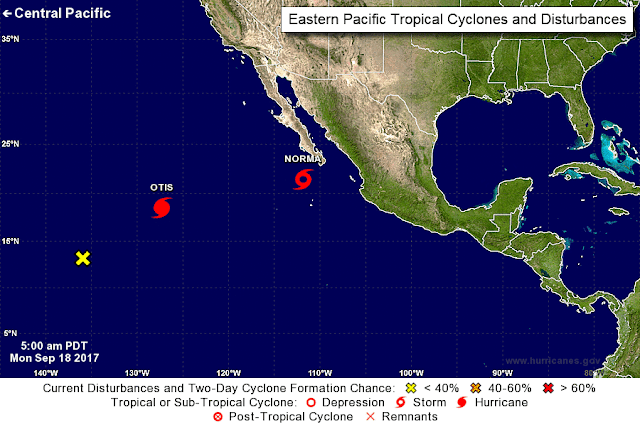 Most weather action remains in the tropics, as per the morning updates from NHC. In the Atlantic (above) both Jose and the "X" east of Venezula pose threats to the mainland US (appears as if the "X" spun-up rapidly during the night and is probably already TS Lee. 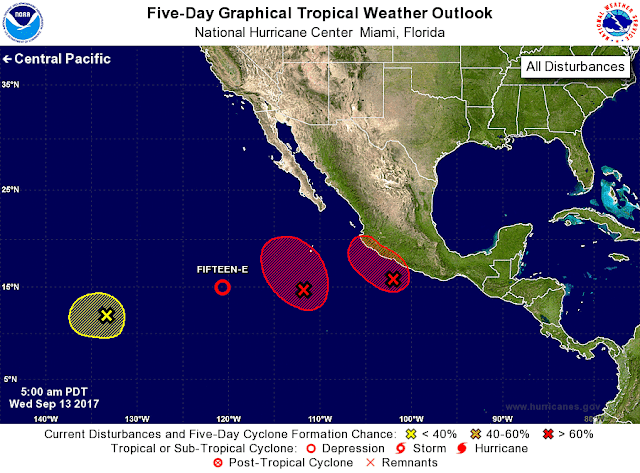 To our south (below) hurricane Norma is forecast to move toward southern Baja and then be pushed around by the deepening trough over the West. At bottom is 00 UTC WRF-GFS forecast on 5.4 km grid for total precipitation through 5:00 pm on September 23rd. That model indicates the dry, trough to the north will preavil and keep Norma's impacts to the south. Above plot shows ALERT measured rainfall for past 30 days ending at 5:00 am MST this morning, indicating how miserably dry it has been for most of the metro area since mid-August. Plot of detected CG flashes (from Atmo and Vaisala) below is for 24-hours ending at midnight last night. Models were right on, keeping most storms north of our area. There were some storms to the south affecting Santa Cruz County, with one storm off to southeast of metro area in Pima County. Forecast above from 00 UTC WRF-GFS on 5.4 km grid shows precipitation through 5:00 am next Monday. The forecast indicates continued DRY. The heavy rainfall over Baja Sur is from forecast hurricane Norma (Max went inland over southern Mexico) - the nasty trough pattern over the Southwest shunts Norma off toward northern Mexico. Forecast for 500 mb (from 00 UTC ECMWF) is valid next Monday at 5:00 pm - the western trough continues to amplify in the forecasts through at least the early part of next week. Have an appointment this morning and have only taken quick look at current situation. Photos top and bottom are from yesterday afternoon and evening, when some lonely Cbs developed. Plot of detected CG flashes through 5:00 am MST (above from Atmo and Vaisala) indicates isolated activity around here yesterday afternoon, and considerable early morning thunderstorm activity over Rim Country, White Mountains, and northwest Arizona. Morning sounding analysis at TWC from SPC indicates a bit of CAPE this morning , as well as deep southwesterly wind profile with PW of 1.25 inches. WRF-GFS forecast from 06 UTC of TWC sounding (below) is at 2:00 this afternoon, indicating some chance of storms in the area. The surface plot second below is for 7:00 am - Pacific front/dryline has moved into western Arizona. Timing may be an issue with the various models forecasting storms to stay north and east of Tucson this afternoon. Running late this morning. Of note was the record high of 106 F recorded at the NWS ASOS site at the airport. The 500 mb cyclone is located just southwest of San Francisco this morning at 12 UTC (analysis above from SPC), and was again associated with widespread thunderstorm activity yesterday from central California eastward across the Great Basin. Forecast models finally kick this feature eastward and this morning's 12 UTC NAM forecast of the 500 mb below is valid at 5:00 pm tomorrow afternoon. By then the wind profile will have become southwesterly and strengthened considerably, producing a classic transition pattern for Arizona. The key forecast question will be how much moisture and CAPE can develop ahead of the short wave. Above is this morning's 12 UTC WRF-NAM forecast of PW valid at noon tomorrow. With PW remaining near and just over an inch, some cooling at 500 mb could lead to CAPE and fast-moving thunderstorms over parts of southeastern Arizona tomorrow. The morning outlook from NHC for next 5 days (below) indicates considerable activity over eastern Pacific, but long range forecast models are very divergent re where any tropical storms that develop might track.